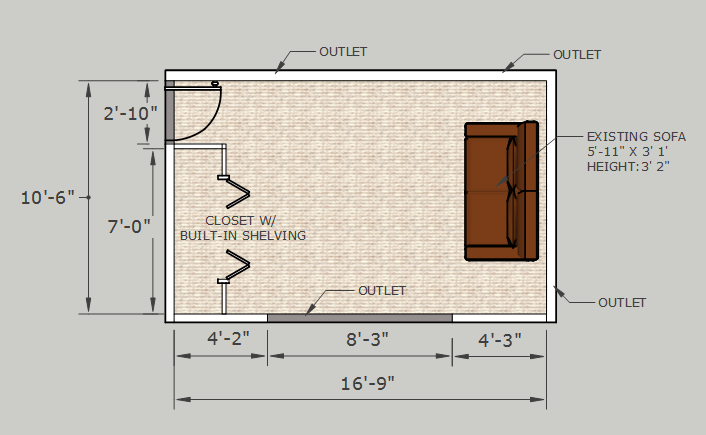 16'- 9" x 10'-6" x 8' 2"
Something that I would like to see changed is the closet space. 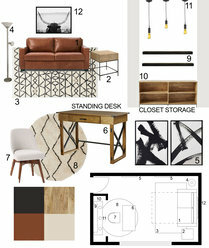 Ideas for this space include a coved storage space or accent wall. 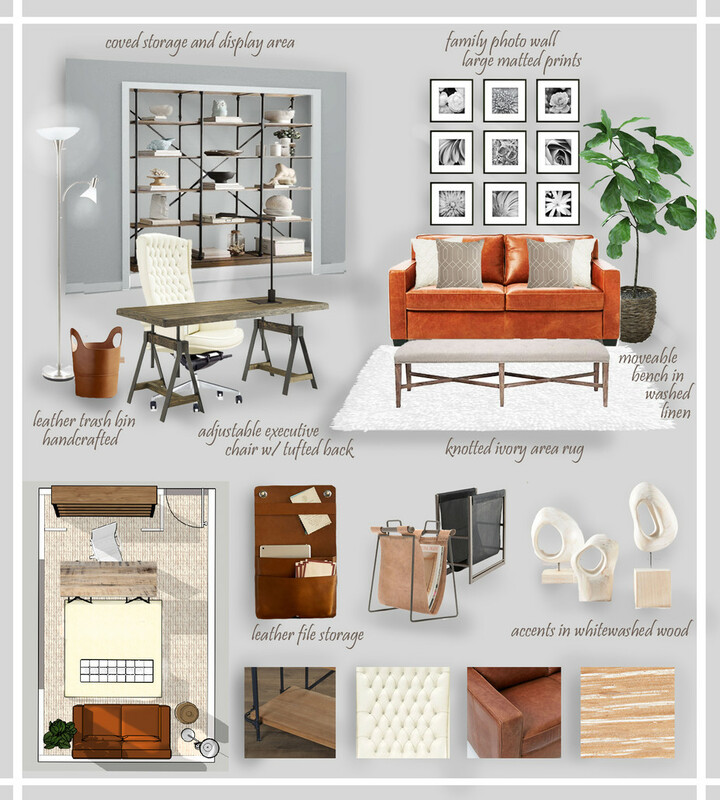 Cognac leather sofa stays but can be adjusted per design direction. Lamp is not required but may be incorporated. Wall color and flooring are to remain the same. My wife would like a standing desk if one can be found that's stylish and maintains the modern look. 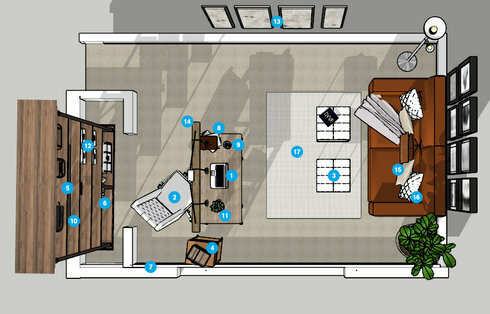 The office will be used by my wife and I at different times. We will both be working wirelessly so cable management isn't an issue. The sofa has a pull-out bed that will be used by guests. Clearance should be allowed for when the bed is being used. Perfect, we're ready to go, love how everything is going! Let me know what we need to do to move forward, thanks! 17 Supreme White Area Rug by Rug and Decor Inc.
Gray works excellently. Continue to explore the contrasting possibilities of natural tones and layered textiles. Existing color pairs well with furnishings and the room's natural finishes. Emma Desk Chair INFORMATION The Emma High-Back Office Chair with Arms in white leatherette upholstery features a biotechnology design with a high back with tilt control tolerating easy tilt backwards and a padded headrest. Designed to maximize productivity, it features a gas-lift adjustable seat height, a swivel facility, and chrome armrests. This office chair is designed for tall persons and extended use and stands on a 5-point chrome rolling base with hooded castors for convenient immovability. It features a non-adjustable lumbar support with a 550-lb maximum weight capacity Features Upholstered in white leatherette Chrome armrests Padded headrest Gas-lift adjustable height Tilt control and tilt backwards Lumbar support and not adjustable 5-Point chrome rolling base Hooded castors Emma collection Product Details Seat Height Adjustment: Yes Product Type: Desk Chair Swivel: Yes Armed Arm Type: Fixed; Padded Discount link available to project holder only Weights & Dimensions Adjustable Seat Height Minimum Seat Height	17 '' Maximum Seat Height	20 '' Other Dimensions Overall	24'' W x 27'' D Seat	21'' D Minimum Overall Height - Top to Bottom	48 '' Maximum Overall Height - Top to Bottom	52 '' Overall Product Weight	47.9 lb. Quantity: 2 Information Incorporate modern design and true functionality into your home with the Delia Ottoman from Porthos Home. This cube seat is slender enough to fit anywhere you need it, but designed to make a statement. Crafted using a sturdy steel base, high quality foam and eco-friendly button tufted polyurethane leather, this piece is uncompromising when it comes to quality materials and eye-catching design. Features Delia collection Button-tufted Material: Polyurethane leather Modern design Steel base Product Details Shape: Square Upholstery Material: Faux leather Storage Available: No Discount link available to project holder only Overall	18'' H x 18'' W x 18'' D Legs	18'' H x 2'' W x 2'' D Overall Product Weight	13.27 lb. Faux Leather + Brass Pencil Cup A sophisticated addition to any work station, our Faux Leather + Brass Office Accessories keep all your desk essentials organized and easily within reach. Faux leather and brass. Set includes: Pencil Cup, Small Tray, Paper Tray and Magazine Butler. Imported. Discount link available to project holder only Pencil Cup: 2.5"w x 3.5"d x 5"h.
Mid-Century Turned Leg Tabletop Planter (small) Inspired by the clean silhouettes of the '50s and '60s, our Turned Leg Tabletop Planters stand on tapered, solid wood legs with a glazed, ceramic bowl. Solid wood legs in Walnut; solid white ceramic planter. Indoor only. Does not have drainage hole. Made in Vietnam. See our go-to guide on terrariums for tips. Discount link available to project holder only Small: 3.75"diam. x 3"h (Stand); 4.3"diam. x 2.5"h (Planter). Wood Knot 4 Piece Framed Photographic Print on Canvas Set (SKU: LTRN5719) Wood Knot is a gorgeous reproduction featuring a weathered wood board with nine knots in it. A wonderful piece that will compliment any home or office. 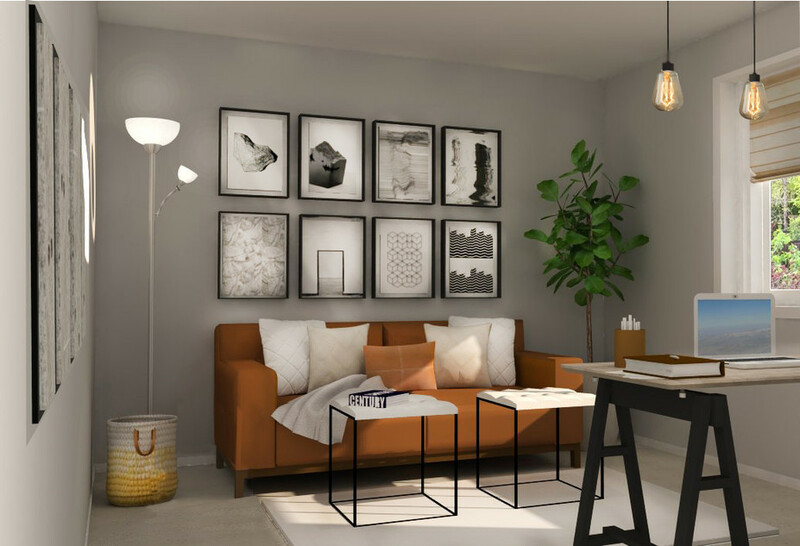 Features Set includes 4 wall arts Floater framed canvas staggered set Made in the USA Discount link available to project holder only 24" H x 36" W x 2" D Size Overall	2' H x 3' W x 2'' D Overall Product Weight	7.3 lb. 36" H x 54" W x 2" D Size Overall	3' H x 4' 6'' W x 2'' D Overall Product Weight	9.1 lb.